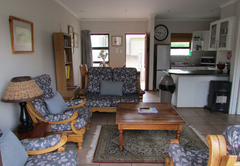 No 4 The Mews is a highly recommended property providing self catering in Clarens for up to 6 guests visiting the Thabo Mofutsanyana region. 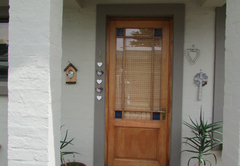 No 4 The Mews, is a modern self catering home in a secure and quiet establishment of eight town houses in the main street of Clarens. 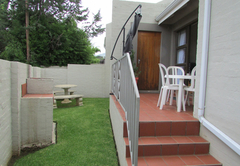 The Mews is walled, and has an electric gate for those who are more security conscious. 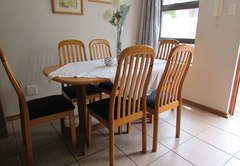 This makes it ideal for families with small children and pets. Within walking distance of shops, restaurants and galleries, The Mews provides a home away from home. 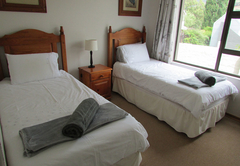 The house sleeps four and consists of two wall-to-wall carpeted bedrooms, the first with a queen size double bed, and the second with twin beds. 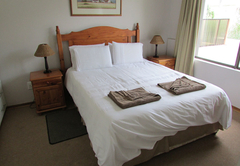 Both bedrooms are North West facing with views of Titanic Rock and the surrounding hills of Clarens. 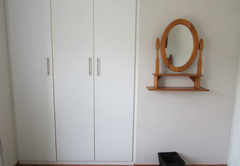 Both bedrooms have lots of built in cupboard space for visitors who would prefer a longer stay. 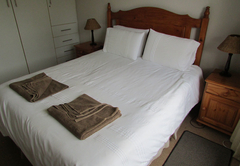 All bedding and towels are provided. We welcome children of all ages and for those who cannot leave pets at home, we would love you to bring them as well. 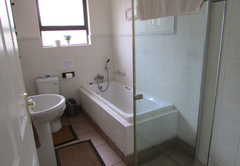 The Mews has two bathrooms, the main bathroom being complete with bath, shower and toilet. The second bathroom has the added convenience of another shower and toilet. 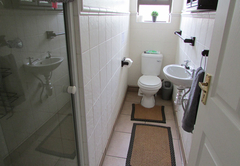 Both bathrooms are tiled and have under-floor heating. 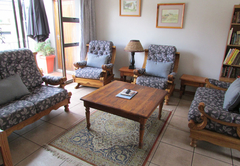 A spacious open plan tiled lounge and dining room area, opens through sliding patio doors onto a small private entertainment area overlooking lovely views of the mountains and scenery for which Clarens is famous. 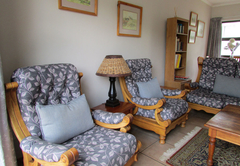 A built-in braai and patio furniture for enjoying the outdoors, complete the picture. 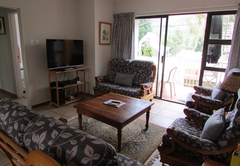 All living areas have under floor heating, and DSTV and a DVD player are provided for leisurely viewing when the weather isn’t so great for walks and the various activities that Clarens has to offer. A single lockup garage is attached to the house. There is also ample parking on site for a second vehicle. 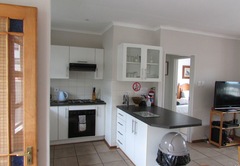 A newly fitted and well equipped kitchen is also part of the open plan living area. 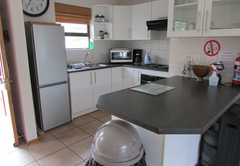 It has a 4 plate hob and under counter oven, fridge / freezer, microwave oven, toaster, kettle, coffee plunger, kitchen utensils, ample cutlery, crockery, glasses. 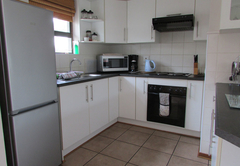 Tea, Rooibos, Coffee, creamer, and sugar are also provided. 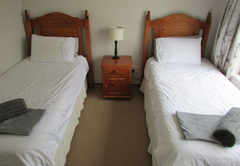 2 Bedrooms accommodating a maximum of 4 adults and 2 children on a mattress, a queen sized bed, and 2 single beds, with electric blankets. 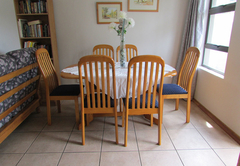 Lounge and dining room. Two Bathrooms consisting of 1 bath and 2 showers. There are 2 toilets. 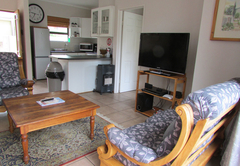 Fully fitted kitchen and Full DSTV, plus a garage. 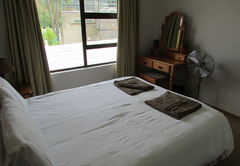 Neat and clean, enjoyed the stay. Enjoyed our stay and really happy that we could take our danes with, they enjoyed the hiking trails! Response timeNo 4 The Mews typically responds to requests in 5-10 minutes.